Here's a closeup. The colors are little better here......watch your eyes. I'm about 1/2 down the leg of it's mate..but I can tell that very little knitting will be done today. The loom is singing it's sweet siren song, and I must answer it. Plus, breakfast. Arrrrgh! My eyes!!!! They burn!!!!! Memo to self... Don't go blogging before coffee.... it's too traumatic. Very nice sock though. Should be warmer than 1,000 suns. *g* I warned you, didn't I? The major problem now is that Herself is simply beside herself wanting a pair Just Like These. The problem? (besides the whole "I can't knit another pair of these and keep my sight" thing) I don't know what brand/colorway this yarn is! It was gifted to me, and I put it gently on the computer table so I could ignore contemplate it each day. Zoey decided it was dangerous, so she took both balls outside and killed one of them. She had just started stalking the other when I got home and surveyed the damage. Both ball bands were gone, 1 ball had it's innards strewn all over the yard (even up in the fort...I have no idea how she got it up there), and the other was drool covered. Surprisingly, there were no breaks in the yarn - either ball! Patternworks has Kroy in self-striping and faux Fair Isle ($6/ball) and Fortissima 6-ply ($10/ball) Fair Isle. Both seem to have colorways that break the sound barrier. If you can't get to a yarn store that might be the way to go. There are a couple of LYS's around here that seem to like stocking loud sock yarn, so I could go shopping on your behalf if you gave me some preferred colorways. 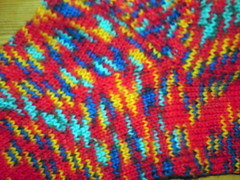 I've got a pair of self-striping socks on the needles at the moment that are blue/grey. I just can't seem to get on with them. I suspect the colorway is just too boring. When I get the camera up again, I'll take pictures of the socks I like to wear with my Doc Martens when I'm dressed head to foot in black. They might amuse you. There aren't any yarn stores (except Wally World, which doesn't count) within 60 miles of me. :sob: I'm not counting JoAnn's or Hobby Lobby/Michael's either, since they tend to stock only faux fur and thick acry-lac stuff. If you wouldn't mind shopping, I would appreciate it! (Paypal is my friend...*g) Herself wants loud, Rainbow yarn (I think she'd be happy with screaming florescent yarn, personally - she has no taste or color sense right now..she's 8, and these socks thrill her to death.) Her winter hat for this year is out of "sunset" yarn (the roving was god-awful; pink/red/yellow/orange) and a purple mix we did here (it came out purple/blue/lavender - you can see a pic of the swatch here and the "matching" mittens here) Himself is in exile in his room right now (long story involving a kindergarden that has no naps and a boy that really needs them)....but he likes bright, primary colors with emphasis on blues. Or Star Wars.....I'm spinning yarn for this year's winter hat/mitten set, and he chose a roving in blues, purples, and pale silvers. I'd be only to happy to pick up some sock yarn for you. Just don't twist so hard -- my arms can't take it!!! I might get time to go tomorrow, if not it'll be next weekend as the store that has the best selection is in the opposite direction to work. It's not far, just over *there*. I'm in no rush - the *kids* are, but I'm not. Which why we knit for the little brats to begin with. Because we love them, not to give them bragging rights.